Russell Westbrook of the Oklahoma City Thunder at American Airlines Center on March 16 in Dallas. For most sports fans, this past weekend meant near-nonstop basketball watching — of the college variety, that is. 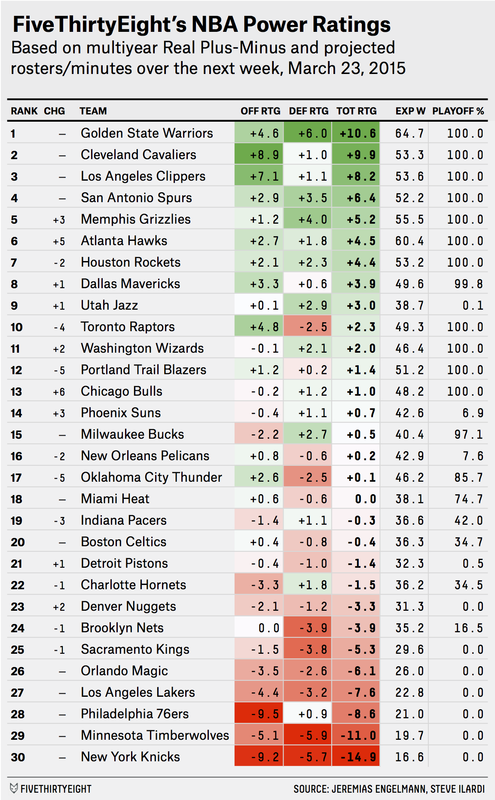 But NBA players were also in action, so it’s time for this week’s edition of FiveThirtyEight’s NBA Power Ratings. How do these numbers work? All 30 NBA teams are ranked according to a projection of their true talent over the upcoming week — and the upcoming week only — using Real Plus-Minus (RPM) player ratings provided by Jeremias Engelmann and Steve Ilardi. For more details on the methodology, see our introductory rankings post. 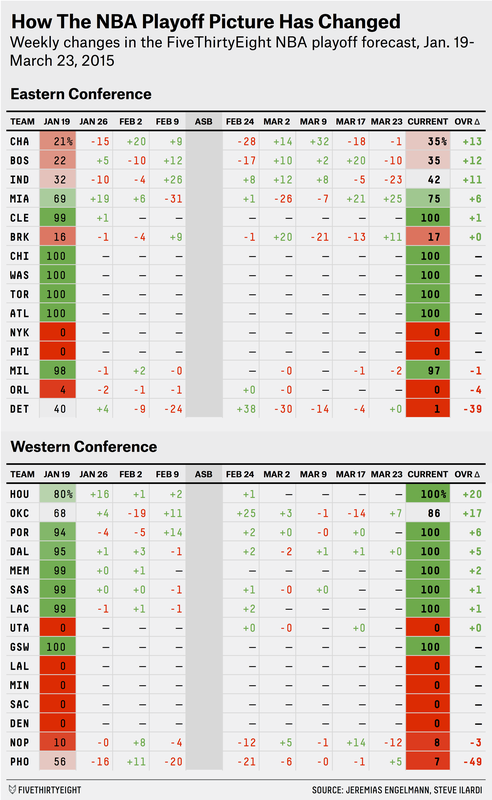 The Western Conference playoff field has been relatively set since we started tracking it. Six of the eight slots were all but locked up in late January (the Portland Trail Blazers brought up the rear of that six-team group with a 94 percent playoff probability). The seventh spot was strongly favored to land with the Houston Rockets, who had an 80 percent likelihood of making the playoffs. Barring a Rockets collapse, the battle for the final spot out West was going to be between the injury-riddled Oklahoma City Thunder and the Phoenix Suns, with OKC holding the inside track because of a superior talent rating. Fast-forward to today, and seven Western Conference slots are practically set in stone (according to our model), as Houston quickly added the remaining 20 percent to its playoff probability not long after our inaugural rankings. That leaves three teams — the Thunder, Suns and New Orleans Pelicans — currently duking it out for the West’s eighth and final playoff slot. While the Thunder have continued to struggle with injuries, their chances of grabbing the No. 8 seed in the West are still 86 percent, as the Suns lost 49 percentage points of playoff probability since mid-January and the Pelicans have been treading water. Phoenix and New Orleans currently have better RPM talent ratings than Oklahoma City (despite the Suns jettisoning a lot of talent at the trade deadline), and both teams are within striking distance of the Thunder’s record. But the Suns’ remaining schedule is significantly more difficult1 than that of either Oklahoma City or New Orleans, and the Pelicans’ slim schedule and talent edges over OKC probably aren’t enough to offset a three-game deficit in the standings. Meanwhile, the Eastern Conference playoff picture isn’t a whole lot clearer than it was in January. Back then, six of its eight playoff slots were essentially locked up, with six other teams possessing a playoff probability between 15 and 70 percent. Now there are still six spots almost completely wrapped up, with five other teams’ playoff chances hovering between 15 and 75 percent. Only the Detroit Pistons dropped out of the race completely, shedding 39 percentage points of playoff probability since Jan. 19. Realistically, the Brooklyn Nets (17 percent playoff probability) are still long shots, and the Miami Heat (75 percent) are relatively likely to grab one of the two available spots. But the race for No. 8 is as wide-open as ever. A few weeks ago, the Indiana Pacers had a 71 percent chance of making the playoffs, but they’ve lost 29 percentage points of playoff probability since March 9, and now are only marginally better positioned than the Charlotte Hornets or Boston Celtics. Charlotte, too, has seen their playoff chances decline over the past two weeks; after having a coin-flip’s chance at the playoffs in early March, they’re looking at just a 35 percent shot at the postseason. And whenever one team loses playoff odds, another team (by definition) is there to scoop them up. One of those teams, the Heat, spent the past two weeks drastically shoring up their playoff chances after seeing them drop to 30 percent on March 9. Meanwhile, the Celtics have added 23 points of playoff probability since their odds bottomed out at 12 percent in late February. (Although Boston also lost 10 percentage points from their playoff chances over the past week.) Even the aforementioned Nets, left for dead at 6 percent a week ago, clawed their way back into the mix as Boston and Indiana saw their probabilities fall since last week. All of this figures to set up an intriguing three weeks of basketball to close out the regular season. Whoever wins out will have earned the right — in all likelihood — to lose in the first round of the playoffs. That said, most of the teams battling for the final playoff spots are good enough to keep the top seeds in each conference on their toes. As measured by the average RPM power rating of their remaining opponents after adjusting for home-court advantage.